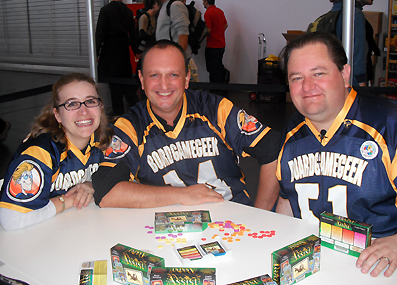 ASSIST VIDEO with Beth, Angelo and Scott at the BoardGameGeek Booth! A Family, Pokery Card Game that Aldie during the video commented like that: "I love this game" - "This is Wonderful" - "This is Great" - "Still one More"... Dear friend, thank you for your kind words and very glad you all appreciated Assist! 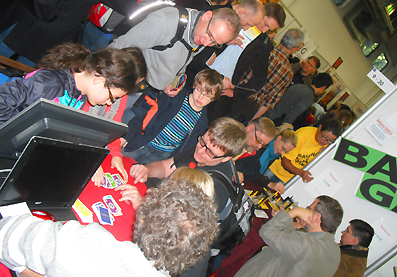 The usual party that took place in all Essen Fairs in front of our Booth 9-30: the Fragor Brothers and their families always bring something new to entertain the audience, with their games, drinks and foods! 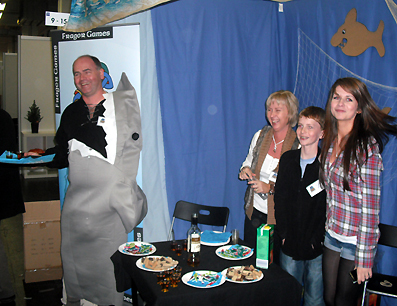 Here Gordon is feeding friends while his body is feeding the shark of their last boardgame: Poseidon's Kingdom! Our Area Autoproduzione booth welcomes for the second year Nestor Romeral from Spain, this year only on day 1 because he just become dad a second time! Here is interviewed by Andreas Buhlman of Cliquenabend.de, a german passionate that works more than a journalist and was so kind to interview me many years ago as first Italian designer on his website. Here you find that historical presentation available in English and German. Another passionate that worked as a real italian-german luding journalist is Jost Schwider who opened on 2005 the italian-german website Spielepizza.de. 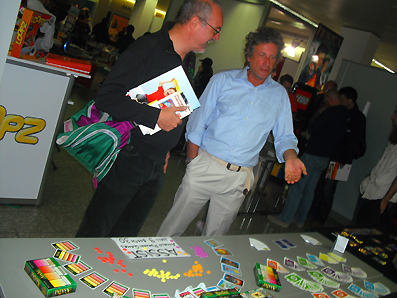 Here I introduce him to Giovanni Calcagno from Genova and his orange card game Play The Sign, available in 5 languages; you can find it on BGG too, of course. 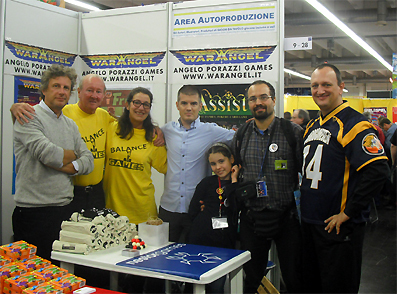 Many thanks to all the people, friends, authors, gamers who meet us at our booth just to shaking hands or for a talk, not shooted in the PhotoReport. 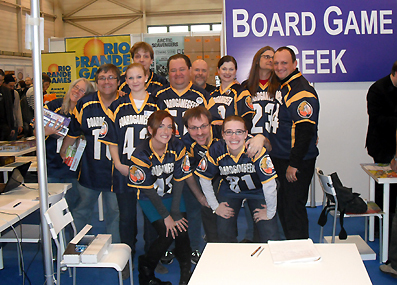 What a nice time whe had in EssenSpiel 2011! Beautiful weather with sunny days: this autumn either in Italy and Germany is really good. 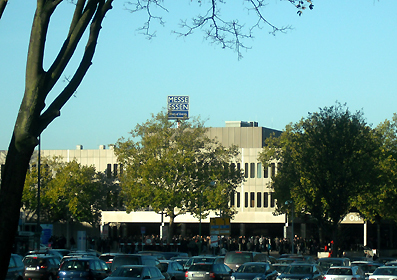 Here the huge Messe near the green GrugaPark, with the crowd entering the main entrance. 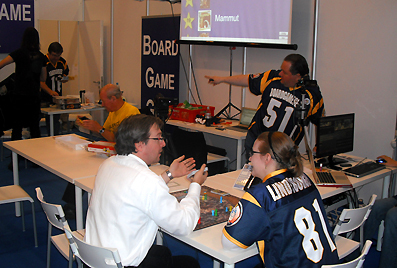 Inside, our usual, international Area Autoproduzione Booth in Hall 9: Giovanni Calcagno from Italy with PLAY THE SIGN, Bum van Willigen and Trudy Bax from Holland with BALANCE GAMES, Nestor Romeral from Spain with NESTOR GAMES, Angelo Porazzi the italian BGG Quarterback, with ASSIST. 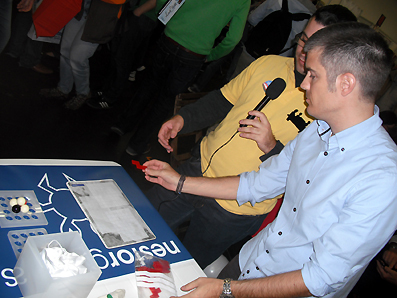 In many interviews comes out what Area Autoproduzione is: Self-Production Area, an idea now invited and hosted in more than 40 Fairs, Schools, Ludoteques... More than 70 inscribed authors that love to create, illustrate and realize their boardgames. Sharing their knoweledge, art, sensibility and contacst with producers like Cartamundi or furnishers like Spielmaterial. 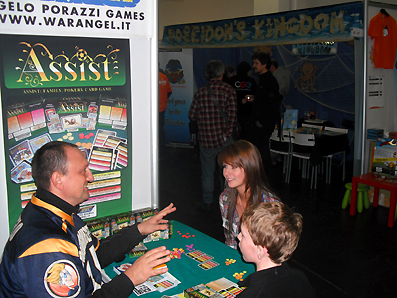 Authors, illustrators, friends, mostly from Italy but not only: many are reaching us in many Italian Fairs: Ludica Milano, Play Modena, LuccaGames... Professionist and beginners joined together, as the subtitle says "The Authors, Illustrators, Producers of BoardGames, play together with you!" 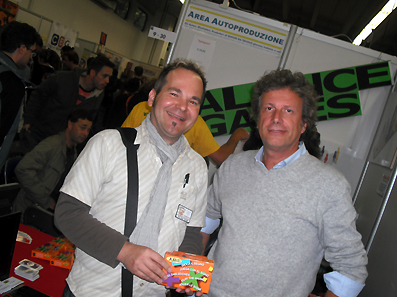 Here is Giovanni, author of Play the Sign, when I introduced him Silvio De Pecher, one of the founders of La Tana dei Goblin, the oldest and most complete website in Italy about Board Games. Our two games Assist and his Play the Sign are here shown on the Press Conference tables. 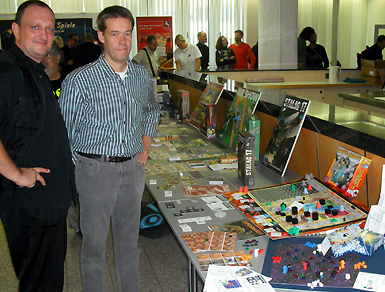 Where I also meet the author of Space Bastards: another excellent self-produced games designed by Jiri Mikolas from Praga. 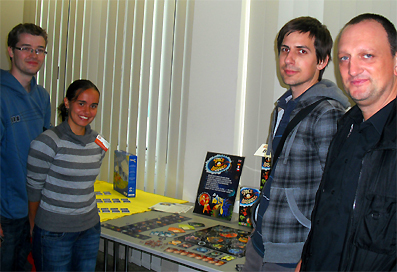 This group was right in front of us in the fair and is nice to meet such young authors making complete boardgames with good artwork and nice ideas like the one to shout "Space Barstards" when arriving at their booth, just to have a better price! 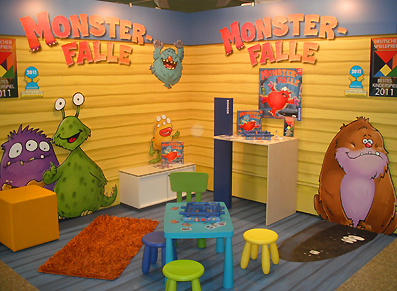 Monster Falle, awarded best children game of 2011, had one of the most coloured presentation booth: I like this simple game and his "cartoomics monsters" so much:). ... the title is AstroNuts, a funny star game of colonization and alien meetings, good for all family. 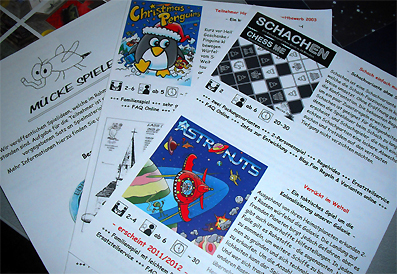 Now it is up to Nicole Mucke to translate the french Rulesheet, Italian and German rulesheet are ready to print: we hopefully see AstroNuts printed in next Ludica Milano, 16-18 march 2012! Fabio and Giovanni from Italy, Nestor, Silvia and Pepe from Spain, Bum and Trudy Bax from Holland, Angelo happy like a child 47 years old, for gathering so good luding friends from allover the world. Fabio is the founder of Giochi sul nostro tavolo, an italian blog that in last years is having big success because of this credibility that comes from its HONESTY to be COMPLETE. As soon as all of us will have the capacity to communicate each other, expecially who made professional luding journalism, think this luding world will go on better and better. 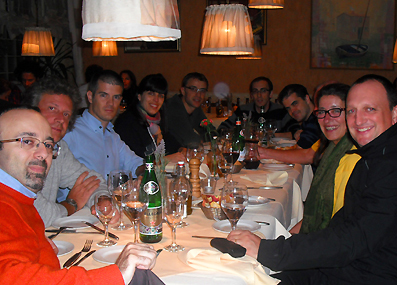 See you in next Con: here all the Area Autoproduzione meetings of a super busy 2011. Next one: Area Autoproduzione at LuccaGames, thanks for the excellent presentation on their website!